Ford has face lifted its Focus in a bid to keep it relevant against fresh rivals such as the Mazda3. 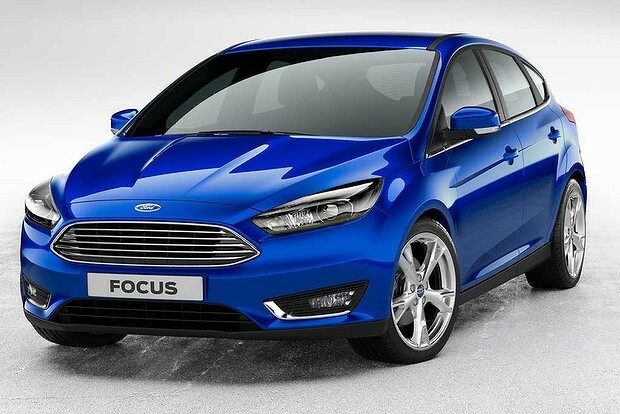 Images of the new Focus have hit the web ahead of its official debut at the Geneva motor show. The blue oval has simplified the car’s front end, which now features a slimmer trapezoidal grille similar to that seen on the new Ford Fiesta. Gaping triangular apertures on the old car's bumper have made way for slimmer design details with chrome accents framing new fog lamps that sit below sleek headlights. The rear retains a similar look to the current car, but the hatch’s interior will be barely recognisable to current owners. The complicated, button-laden dash of the old car has been replaced with a much simpler layout featuring a larger infotainment screen compartmentalised into four zones that look after telecommunications, navigation, entertainment and climate. Ford’s clever Sync suite is also set to return, with the potential for better integration with new smartphones and apps. Under the bonnet, Ford’s local arm may choose to offer its efficient 1.0-litre EcoBoost motor currently used in the EcoSport and Fiesta. Foreign versions of the Focus currently offer the potent 1.6-litre motor seen in the Fiesta ST, along with a 2.0-litre diesel motor currently offered in Australia. The 184kW Focus ST hot hatch is expected to retain its turbocharged 2.0-litre motor, but more power may be on the cards if it is updated in line with other models. Ford is also believed to be working on a red-hot RS version of the new Focus that could take on blue-chip hot hatches such as the Mercedes-Benz A45 AMG. Ford Australia says specifications and arrival dates for the new model have not been announced.